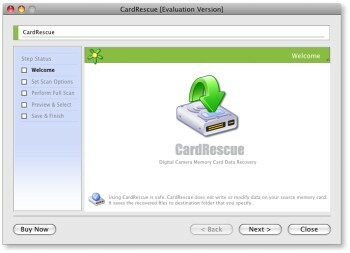 CardRescue is a photo recovery software for Mac OS X. It is designed to rescue deleted photos and movies, or photos lost from formatted or damaged camera and phone flash memory cards. CardRescue recovers your lost pictures from SD, CF, xD card, MemoryStick and more. Photos deleted unintentionally or intentionally from memory cards. Photo loss due to "Format" or "ReFormat" operation in the camera. Memory card corruption, damage, error or inaccessible state. Damage or memory card error due to turning camera off unexpectedly. Data loss due to using between different cameras or devices. Recover lost photos and videos from phone microSD and microSDHC. Is CardRescue Easy to Use? CardRescue's user interface is well designed and users do not require professional skills to use the software. You may need 10 to 20 minutes to complete the lost pictures rescue. Also, the program provides various file formats (including raw image formats) selection before lost file search and provides thumbnail view for the images that can be recovered before saving. Is CardRescue Safe to Use? CardRescue photo recovery supports common image formats (e.g. JPG, TIF) and most raw image formats (e.g. Nikon NEF, Canon CRW and CR2 and many more). It also supports video and movie clips files retrieval which includes AVI, MOV, AVCHD and more. Why are the lost pictures recoverable in most cases? Most digital cameras do not wipe the pictures completely from your camera storage card on deletion or format. It may just remove the filenames and file entries (e.g. name, time stamp, file length), but your photo and movie data may still remain unchanged. So it is possible for CardRescue to search and restore the deleted photos, or lost picture files due to format. Once your digital camera storage card was damaged, lost pictures rescue may still be possible. CardRescue bypasses the original file system on the memory card and retrieves the sector data of the card using low level access. In most cases, it is able to recover them. But data recovery is not always possible. Are my lost pictures recoverable? Usually, if you have not taken new pictures on the memory card after deletion, or formatting, the lost pictures are recoverable. If you have taken some pictures, maybe some lost pictures were written over and some may be still recoverable. For corrupted SD cards, it mainly depends on the condition of the SD card. It is recommended to download the free evaluation version of CardRescue to see if your lost pictures are found. It may just take 5 - 20 minutes. The overall success rate is over 90%. CardRescue software supports almost all memory card types including SD Card (SD, SDHC, SDXC, MicroSD, MicroSDHC), CF (Compact Flash) Card, xD Picture Card, Memory Stick and more with capacity up to 256 GB.